Well friends my cleanse ended yesterday! I made it to the end! You may have had no doubt, but I definitely had my moments. Like anything worth doing, this wasn't without its challenges, but I'm really happy I took the plunge. I hope you've benefited from these blog posts. There were many more things I could have written, but the time just got away from me. Where to from here? Well now I think the more interesting part for me comes: adding foods back in. 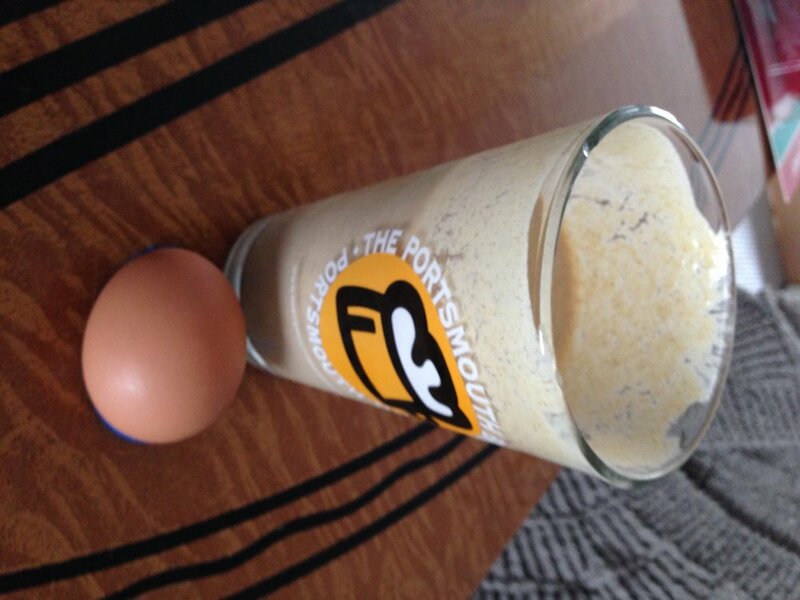 This morning I had my first egg. "How do you feel immediately after eating it? Are there any sensations in your belly? Does anything happen shortly after you eat it? How are your energy levels? How are your bowel movements the next day? How did you sleep that night? How does your skin look, and how are your emotions the following day?" Junger, Alejandro (2009-05-12). Clean (Kindle Locations 3188-3194). Harper Collins, Inc.. Kindle Edition. I'll be keeping these questions handy as I reintroduce things. Would you like to hear more about that process? Let me know in the comments. Finally, I realized that I never had a chance to share with you some mantras that are good to use with food. I've had the pleasure of studying Sanskrit with Manorama a few times and she tells a wonderful story about using mantra with food as taught by her guru. You can read that story here. I've found that a similar experience has happened to me. I tend to think about mantra over and with food more when I'm making something to be shared at the studio. The results are astounding. So here are a couple of mantras you can use with food. May all being everywhere be happy and free and may my words, deeds and actions contribute to that happiness for all. Om. Accept us both together. Protect us both together. May our knowledge and strength increase. May we not resent each other. Both of these mantras can also be chanted while you prepare your food. The energy of the mantra will be infused into the meal and make it that much more nourishing for your body! Have you ever noticed that your mood while cooking changed the taste of your food? Let me know in the comments! Thanks again for reading this blog series! I hope you've enjoyed it and found it valuable for encouraging you to think about your food in a new way! Disclaimer: Not all yoga poses are suitable for all persons. Please consult with your health care provider and obtain full medical clearance before practicing yoga or any other exercise program. The information provided in this blog is strictly for reference only and is not in any manner a substitute for medical advice or direct guidance of a qualified yoga instructor. Spring Cleanse Journal #3 - So what the heck DO you eat? When I last posted I talked a lot about how things were feeling and some of the ideas behind the biological processes that a cleanse really brings to our awareness. Now, I want to talk about FOOD. Food really is such an essential part of our daily life, not just because of it's necessity for our survival, but also because of how much it is a part of our culture. Not just our ethnic culture but our daily culture and interactions with other human beings. Food can be incredibly social. Food can be relatable or not-relatable depending on our habits. It can draw us together or push us apart. Looking back 10 years later I fondly smile when I remember my poor Mother's reaction to my hypoglycemia diagnosis and my new dietary needs. "No PASTA?! What the heck am I going to feed you?!?" (Just for the record, Mom is half Sicilian so the idea of no pasta is pretty much like the idea of no air to breathe.) And then when I threw in that I wasn't eating meat anymore? My Father will still look at me sometimes and ask with an air of incredulity in his voice, "So what the heck DO you eat?" Nuts and berries Dad. Nuts and berries. But to be a little more serious, food can really be an important function in our lives living and relating to others. During this cleanse I have been mostly eating my own food by myself. When my husband is around we are making separate meals, but eating them together. I'm not going to lie, it makes me (and him actually) a little sad. There is something about sharing a meal with someone you love that is very connecting. During my yoga teacher training back in NJ this was an important aspect of our time together that I look back on with fondness and wonder. My teacher brilliantly asked that during our weekend training days, we would all bring a vegetarian dish to the studio and we would all share the food and eat lunch together. What an amazing way to bring a diverse group together quickly! Not all of us were vegetarians at the time and some of us had specific food needs, so as we learned everyone's likes and dislikes and their allergies or sensitivities we adapted what we brought. And we NEVER consulted each other before the weekend on what we were going to bring and it was ALWAYS an amazing meal. In our recent Yoga Intensive sessions at Forever Yoga, I incorporated the same thing with the same effect. Food is a powerful way to bring people together. So today I wanted to share with you a few recipes that I've found during the time of this cleanse that I thought were quite good. They'll give you an idea of how to make clean meals that are healthy AND delicious! Part of this cleanse for me is about breaking out of my routines and not getting stuck in a rut, so I've been trying out some new ideas. Here are a few that I really loved. I'd never made soup in a wok before and I LOVE my wok so I was really happy to find this one! This is a really simple and flavorful meal for the solid meal (remember this cleanse recommends that the biggest meal of the day be eaten at lunch with solid foods) of the day. To keep with the guidelines of the cleanse I didn't use the jalapeno (I'm a wimp when it comes to very hot spices anyway), the corn chips or the tomatoes. I did wilt some spinach over it and added avocado (one of my FAVORITE foods). 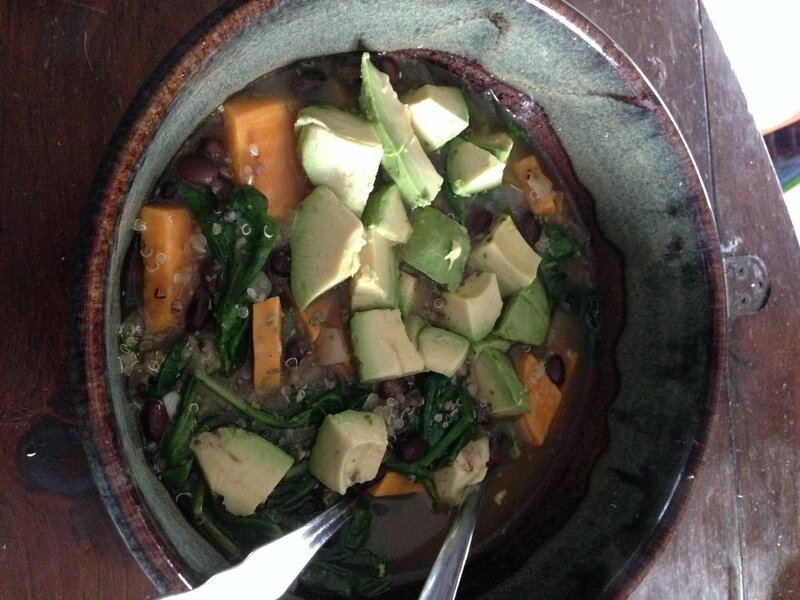 Super yummy results and with the sweet potato it was really nice and filling and grounding for early in the cleanse. The weather was pretty raw on the day I tried this out too so it was nice to have such a warm filling meal. Oh. My. God people. This may not look like much, but there just aren't enough exclamation points in the word for this one! A friend of mine posted this recipe a while ago and I'm SO GLAD I saved it to try at some point. This is ridiculously yummy. I can't even begin to tell you. While the recipe mentions this being a quick evening meal, try it out when you don't have to rush. It's a little complicated and took me well over an hour to make the first time around but it was totally worth it! 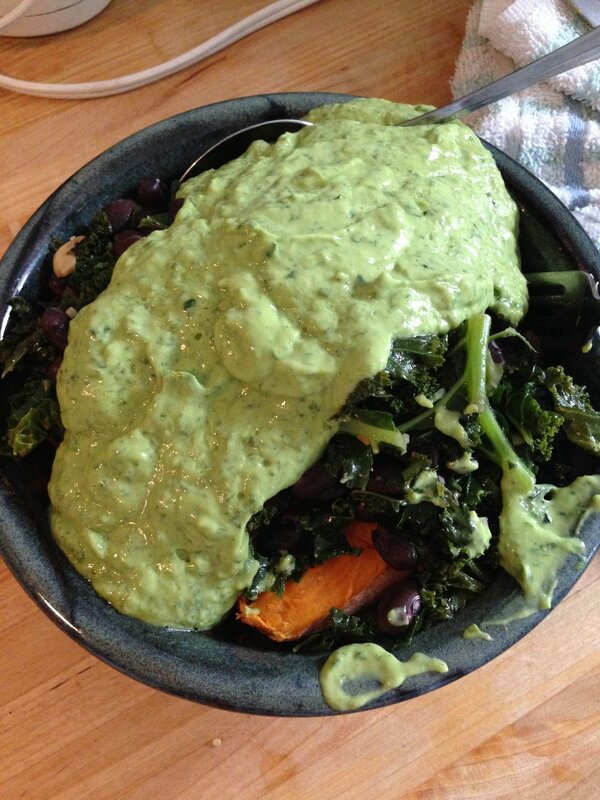 The Green Goddess Dressing that goes with this is absolutely amazing. It was also part of what got me hung up time wise making it, so make sure you have the right tools available to you. No modifications necessary for this one to meet the guidelines of the cleanse. Cleansing or not I'm totally adding this to my repertoire. I haven't had vegan food this good in a long time, and especially not out of my own kitchen! 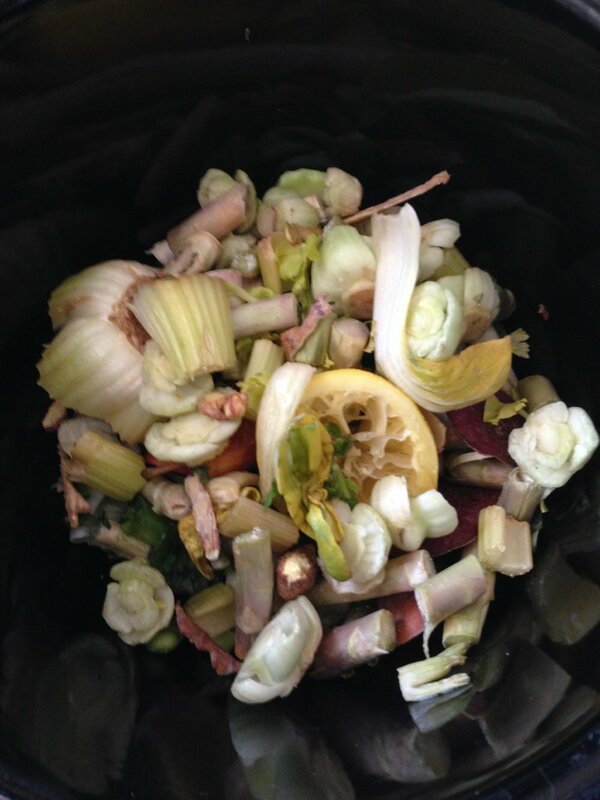 Make your own veggie broth/stock! This is a recipe that I adapted from a friend who got it online somewhere I think. I love this because it's rich and filling without adding dairy and has a nice little flavor and spice from the curry powder. Method: Heat the oil and add the onions and a pinch of salt. Sweat the onions for 2-3 min. Add garlic and sweat a bit more until that nice onion/garlic aroma meets you. Don't let them brown though. Add peas, broth and curry powder. Bring to a boil (if you're using the frozen veggie broth method I described above this is where that works in.) Reduce heat to low, cover and simmer until the peas are soft, 40-50 min. Puree with an immersion blender. Enjoy! Umeboshi Scallion Dressing from Kripalu - this was in my Kripalu cookbook. Super easy and super flavorful. I tried it over a more traditional salad but I think I'm going to use it over a wilted greens salad with some bok choy next. Vegan Cheese Sauce - Wow! This was another super find! Absolutely delicious over steamed broccoli and asparagus for lunch one day. In the future I would cut back on the salt a bit but still quite tasty. The picture is a little misleading though. For me it turned out pretty solid, but I might have blended it a touch too long. And if you don't have a Vitamix, DO IT. You won't be sorry. I just got one during this cleanse and I absolutely LOVE it. The hype isn't just hype. This is one amazing machine and I feel like it's saving me a ton of time and energy in the kitchen, especially with all the smoothies I've been making. And hey, are you following Forever Yoga on Pinterest? I'm pinning recipes and other good stuff there from time to time, so check it out! Put it all in a blender and let 'er rip! A nice taste of fall in the warmer weather. I hope you've found some food inspiration here! I know I've really enjoyed breaking out of my routine and trying some new things. If you've found this post valuable, leave me a comment and let me know! Happy Eating!! Sorry for the radio silence on these blog posts. My good intentions to write every couple of days have been derailed, but the good news is that the cleanse has not! That is still going strong, but not without a few bumps here or there. But let me start back at the beginning. So to my shock and surprise, detox symptoms hit me on DAY 2. The previous times I've done something like this it took at least three or four days to set in so I was really surprised. What do I mean by detox symptoms? Headache, a bit of body ache and a general feeling of heaviness are what I experienced this time around. It's almost like how your muscles feel after a challenging workout but before any pain or stiffness set in. They just feel heavy, like they can't possibly do the job you're asking them, even if it's just walking around the house. And if you DO ask too much, they let you know! That heaviness just gets worse. A few days later, that heaviness could still be felt in my muscles, but the lightness I started to feel in my gut was amazing. One of the things we don't typically think about when we eat is how much energy it takes to digest our food, and how much "junk" we might be carrying around if we aren't digesting properly. This is part of what I like to call "After Thanksgiving Dinner Syndrome". Some might chalk that up to chemicals in your turkey dinner, but guess what? Same thing will happen to the vegetarians in the room! And why? Because our bodies use energy to GET energy from our food! There has to be enough energy in the system to break down what's been put in. And when what goes in is disproportionate to what is already there or what is coming out, we get tired and maybe even stay tired over long periods of time. My awareness has really been awakened to this in this cleanse experience this time around. I was diagnosed with hypoglycemia about 10 years ago (my first awakening about how and what I ate was affecting my body) and learned to eat small meals at more frequent intervals to keep my blood sugar on a level plane. I learned to carry snacks with me wherever I went to avoid that horrible feeling that comes with a blood sugar crash. And I also learned to eat a WHOLE LOT when it was available, so hopefully if I ran into a situation where I couldn't get a good meal when I needed it, that I would still be ok. My blood sugar issues seem to have virtually disappeared with the diet I regularly follow these days, but apparently my anxiety about where that next meal is coming from has not. And more importantly, that anxiety may be the underlying cause to the habit of overeating that I've recognized in myself, but haven't been able to solve so far. Cleansing can be just as much of an awakening process as a regular yoga practice. In the second week the heaviness has left the building and new found energy seems to be apparent! I'm usually a pretty heavy sleeper, requiring at LEAST 8 hours a night to be functional in the morning. In the last week I've noticed that I've actually been sleeping less but not feeling the effects of it like I normally would. There's that energy exchange again. The jury is still out on whether or not that's really a good thing though. I'm definitely not one to advocate for LESS sleep in our crazy modern world. "When you make a vow or a decision, don't expect it to go smoothly. If everything goes smoothly, where is the test to prove that you will stick to that vow? You should even be concerned if no tests come. If you vow not to eat sweets, very soon someone will offer you the most tempting and unusual treat. If you vow to wake up every morning at 4:30 for meditation, suddenly you will feel so tired. You will only want to sleep. Choosing to do something like this is DEFINITELY a test. Especially if it is a far cry from your usual habits. I have washed more dishes per day in the last (nearly) two weeks than I care to count (we don't have a dishwasher). I have frantically been cutting fruits and veggies to throw in the blender minutes before I had to run out the door to teach. I have suddenly found myself looking at the clock and rushing to make and eat my evening soup before the cut off time of 8pm. Is it easy? No. Is it always ideal? No. But this is the commitment I've made to MYSELF for these 21 days. I have been tested and nearly gave up on day 3, but as Swami-ji says, I didn't expect it to go smoothly. Life happens. How we react and respond is just part of the practice. Honestly, if you have considered doing something like this and just couldn't find the *right* time, you may just not be ready to make the commitment. And that's ok. It will come when you're ready. It's been a long hard winter in this part of the world. Hard on the mind and also hard on the body. Ayurveda (the sister science of yoga) teaches us that the winter is a time of turning inward. Of looking at ourselves. Of doing deep inner work. In the spring, we reemerge, just like the daffodils and start moving outward once again both physically and mentally. The spring (and fall) is also the time for cleansing. We talk about "Spring Cleaning" of our homes at this time of year and the physical body is ready to do the same. As the heaviness of winter changes to the lightness of spring, we might notice congestion, sluggishness and imbalance. The transition from winter to spring can bring about physical symptoms that keep us from living life at our peak. So now is the time to clear out the cobwebs in the physical body and allow it to lighten up for the warmer months. It's been awhile since I've done a cleanse. I'm not going to lie, it isn't always an easy undertaking. There's a lot of mental and physical prep before and then there is all the meal prep during. There are the detox symptoms in the beginning that can feel like "Why the HECK am I doing this?". But the lightness that comes when the hurdles have been overcome is worth it. Yoga is all about bringing attention to ourselves. Our thoughts, feelings, emotions, etc. It's about becoming mindful of our daily workings and bringing them into the light so we can truly see ourselves and, perhaps, make positive change. Next to sleeping, I think eating is one of those things that we can go totally "autopilot" on, because we do it so much! And we MUST do it regularly to survive. A cleanse, to me, is really about bringing mindfulness back to what we put into our bodies and becoming aware of how our food affects our physical and mental state. "But I just can't drink maple syrup and lemon water for days!" you say. Well, neither can I. There's a lot of debate out there about cleansing and a lot of controversy. I've done full blown juice cleanses and it wasn't for me. What I am embarking on today is the Clean Cleanse. To try and sum it up, this cleanse asks you to have a liquid meal morning and evening (juices, smoothies, soups) and a solid meal in the afternoon, when the digestive fire is at it's peak. The foods you eliminate during the 21 days of the cleanse are known allergens (like corn, wheat, soy and dairy) and certain foods that can be sensitivity triggers for some people (like nightshades and eggs). I like this cleanse because to me it seems to keep modern issues in mind (like how wheat and soy may be problematic because of the way they are raised or engineered) while also following the ancient wisdom of Ayurveda (which recommends having the heaviest meal in the middle of the day). I've decided to give this cleanse another go for a number of reasons. The first is that I've been experiencing some digestive issues of late (I'll spare you the gory details) and I've been wondering if food sensitivity may be playing a roll. I also have found with my busy schedule these last several months I've been relying more and more on convenience foods to get me through. While I keep a pretty good diet most of the time, busy and tired are my moments of weakness. Out come the frozen dinners or the boxed foods that can be made with little to no effort. And while my selection of these foods is pretty conscious (I choose Trader Joe's boxed Mac & Cheese over Kraft) we all know that this isn't an ideal way to eat. I bet you're wondering how expensive this is going to be and if I'm having digestive issues, why don't I just go to the doctor. Well, for me to go to the doctor for anything other than an annual checkup costs me around $300. Now if it was something serious, I'd be there in a heartbeat and wouldn't think about it. But this is an area where, unfortunately, traditional medicine tends not to take this seriously and/or would probably prescribe drugs that would mask the issue rather than cure the underlying cause. Call it my personal bias, but there it is for you to see. I'm also strictly vegetarian. Something the general medical establishment doesn't seem to deal with well. Maybe I just need a new doctor. But for now, I choose to explore this on my own. And I still have to eat so I'm really not spending much extra outside of my regular budget. The Clean program recommends a plethora of supplements. I won't be using them, because yes, that would get extremely expensive very quickly. I may add a probiotic to my normal supplements but that can be done for around $20. This is what I've done in the past with good results. I also won't be buying ALL organic produce. Again, that would be cost prohibitive for me. But I will do what I can and wash my produce well. To me, this is another part of this program that I like. I can really make it work for me without breaking the bank. Would it be better if I could go full organic? Sure. But will it totally defeat the cleanse if I don't? I don't think so. There are a few other places I'll vary from the program that's outlined in the book/website, but mostly because of experience and trust in my teacher's. In 2011 I did this cleanse guided by my teachers at Naturally Yoga and we brought in some variations that were more in line with Ayurveda than are outlined in this cleanse. For example, I'll be using maple syrup rather than agave. There's been some doubt as to the purity of agave coming into this country due to it's increase in popularity. With maple syrup I can drive down the road and buy it from the guy who made it. That seems like a smarter option to me. I'll also be using local honey as well. I'll probably describe more of the ins and outs in future posts. So why put this all out here in public for you to see? Good question. The first answer is - to keep me honest. I haven't done this in awhile because it isn't easy! Tired and busy, remember? If I put it out there for all to see, maybe you'll ask me about it before class and I'll have to give you an honest answer. Will I probably cringe when I read some of these entries a couple of years from now? Probably. But that's part of the evolution of my experience. The second answer is - I'm a teacher. I think sharing my experience might help you decide if this is something you'd like to undertake. I hope my journey will help you and maybe inspire you to think about what you put into your body. We are all LITERALLY what we eat. Each bite is an important choice. Are we eating just to get through the day or are we eating to nourish this vehicle that carries our spirit on it's human experience journey? The third answer is - to start a dialogue about food and how important it's roll is in our lives. I hope you'll enjoy reading these posts and I would love to hear your thoughts and experience, either in the comments or at the studio.